We’d love your help. Let us know what’s wrong with this preview of A Fall of Sparrows by Paul J. Bennett. Will Seymour is a Confederate sharpshooter who remains steadfast in his devotion to protect his home, but has found his humanity among the casualties of war. After becoming separated from his unit during battle, Will discovers Evaline, an escaped slave, while trying to locate his unit. Will's initially unsympathetic demeanor changes drastically as the pair faces death from Will Seymour is a Confederate sharpshooter who remains steadfast in his devotion to protect his home, but has found his humanity among the casualties of war. After becoming separated from his unit during battle, Will discovers Evaline, an escaped slave, while trying to locate his unit. Will's initially unsympathetic demeanor changes drastically as the pair faces death from forces on both sides of the conflict. Alone in the Virginia wilderness, the pair forms an unlikely bond as they struggle to survive. Will feels driven to help Evaline escape the war zone by crossing the Rappahannock River. The Confederate is determined to protect the young woman who becomes like a daughter to him. His commitment is put to the ultimate test when he is forced to match wits and skill against a lethal renegade sharpshooter. Will's mind is consumed by two burning uncertainties: Can he protect the precious life now entrusted to his care? Will he ever see his beloved home again? To ask other readers questions about A Fall of Sparrows, please sign up. What I Really Liked About Sparrows: There is much to like, but four things stand out. First, Bennett does a great job with his history. He completely nails the food shortage and scarcity of the Confederate Army, as well as Who Would like this Book: People who love historical fiction, literary fiction, nature writing, Civil War enthusiasts, people interested in race relations, idealists, and people who like journey stories. If you are a fan of The Outlaw Josey Wales, you’d probably like this book. 3.5 of 5 stars – Heartwarming Story of Devout, Conflicted Confederate Protecting a Slave. I’m a fan of history and historical fiction, including the civil war era particularly as it relates to the poignant mix of the political, social and human rights issues, and the consequent personal conflicts and hardships. I enjoyed that this book addressed this head on, and in a way that generally got past typical stereotypes and exp 3.5 of 5 stars – Heartwarming Story of Devout, Conflicted Confederate Protecting a Slave. I’m a fan of history and historical fiction, including the civil war era particularly as it relates to the poignant mix of the political, social and human rights issues, and the consequent personal conflicts and hardships. I enjoyed that this book addressed this head on, and in a way that generally got past typical stereotypes and expectations that could have played out from the interesting premise. As Paul Bennett’s first published work, this was a good debut. The writing was easy to read, with some good action sequences, and descriptive, especially of the civil war period details, such as the clothes, weapons, food, shelter and fighting. That and the dialogue, in pretty good dialect, added some flavor to the setting and times. There were times when the flow was not as smooth, so maybe a little more polish was needed. And while the civil war details were good, the psychological understanding was pretty standard and stereotypical, with really nothing too deep or nuanced (such as the treatment and views of slavery, and your standard set of different types of helpers and villains). I will say though that Bennett got me crying at the climactic end. It may have been schmaltzy, but what’s a sentimental guy to do – it was a poignant moment with ironic/symbolic overtones, and tension built up by the action and my caring for the MCs and their well-being. Speaking of which, there was a nice development of the two MCs and their relationship, building to such things as the slave girl being comfortable teasing the Confederate (but the phrasing may have been a little too modern). I also appreciated, and was frankly relieved, that the relationship didn’t go the stereotypical route of being a romantic one, but was more fatherly. One of the categories for this is “Christian Fiction,” yet I did not notice this initially. Since I am not as religiously expressive as some, I am probably approaching it from a little different perspective than some readers. There are indeed religious references throughout, mentioning God, the Bible, specific scriptures and characters having and expressing religious thoughts. While this was definitely a part of the times, I thought it tended at times to be a bit much in a way that seemed to be forcing the issue a bit, making it not quite believable (maybe? : The MC quoting the scripture of the Valley of Death when he’s wounded, his visions of Jesus, the forgiving Federal soldier that just walks away, the MC’s desire to leave money in an abandoned building for food he took). To me they just didn’t always seem to fit in the context of some situations in the story so that they felt more like devices to make a point or advance a cause, versus being natural. Again, I’m not as expressive along those lines, and I’m sure others will not only be fine with it but appreciate it. I received this book through the Goodreads First Reads Giveaway. I first want to thank Paul Bennett for signing the copy of the book that I received. I have my bachelor's degree in English and always dreamed of being sent books in order to review them, so I am happy for this opportunity. I also have my master's in History, so historical fiction has a special place in my heart. This book was an enjoyable read, although I found some of the aspects hard to believe, and not necessarily historically I received this book through the Goodreads First Reads Giveaway. 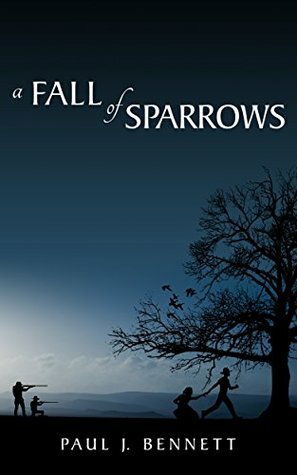 I just finished reading Paul Bennett's "A Fall of Sparrows". I loved it. The story took place during the civil war, and it's the story of a Confederate sharpshooter, Will Seymour. He got separated from his group of soldiers, and faced many obstacles before he was reunited with them. I could not put the book down. It was that good! Very well written book - the insights into the soldier's struggles of faith and loyalty made the story even more engaging. My respect for my friend, Paul Bennett, now extends to his superb writing as well. This book reminds us that God's ways are not always ours and showstopper us that our faith grows when we step out and do what God tells us to do. We see through the main character that if we are obedient, God can change our heart. This is an excellent novel of the American Civil War. I think that it explains the motivations for both sides well. The action is gripping. The characters are easy to relate to, and the work is filled with solid morals. Also, one has to appreciate the historical detail-- particularly with regard to the firearms. I loved this book. I could not put it down. The world needs more Wills. Thank you Mr. Bennett for writing a story I will never forget. This is a fast paced, encouraging story about the true meaning of courage, loyalty, trust and truth.